In 2009 Sam Glasworthy, Fairfax Hall and Jared Brown teamed up with a still named Prudence, and launched perhaps the most iconic gin of craft renaissance in London. Sipsmith London Dry Gin was distilled on the first copper still in London in nearly two centuries. In some ways, Sipsmith Gin was the beginning of Modern gin in London. Sipsmith London Dry Gin stays true to those roots. It begins from a base spirit of wheat, and opts for a fairly traditional botanical bill: angelica, coriander, licorice [seem familiar?]. It’s made with a single shot method of distillation— meaning they only dilute with water, not additional neutral spirit. Sipsmith Distillery was one of the first distilleries of the craft gin renaissance to talk about the single shot vs. multi-shot approach and are a big reason why there’s entire classes devoted to to the subject. Sipsmith London Dry Gin is classic on the nose, but distinctive in its own right. Orange zest dripped with warmed orange blossom honey lends complexity to a nose that has a traditional piney juniper with slight hints of angelica root musk and licorice. The palate of Sipsmith Gin unfolds in three waves. Juniper with an expressed pine character comes on early, with bright lemon curd, mandarin flesh and citrus mid-palate. The finish is where some of those spice notes come through. Cassia, cinnamon and coriander merge into a vague, gentle pepperiness. There’s a creamy hint of licorice root that rounds out an herbaceous juniper note with the slightest hint of bitter orange. Sipsmith London Dry Gin is rich and complex. Although on the palate the spirit doesn’t have the viscosity or thickness of other wheat spirits, the botanical fortitude more than makes up for it. The finish is on the rather long side just sipped neat, with neither warmth nor flavor departing prematurely. I’m a particularly big fan of Sipsmith London Dry Gin in a Martini. The 41.6% is the perfect ABV, even if you prefer a really Dry Martini, going 10:1(!) or even up. Chilled it’s a delight as well with juniper and bright citrus still coming through. 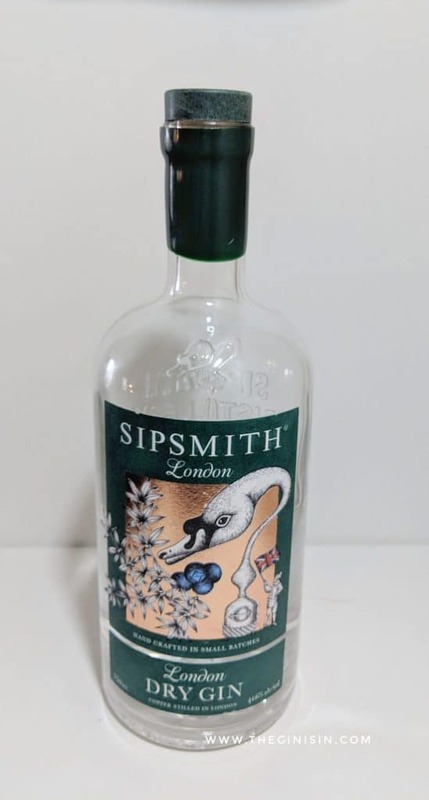 But part of why I think Sipsmith Gin has had such an impressive run of it since it’s 2009 release is because despite it’s minor updates to the classic gin profile, it’s readily recognizable in nearly all cocktails. It was really among the first workhorse craft gins that a bartender could go to for nearly everything. Highlights include 2009 staples like the Aviation, and 1909 staples like the Tom Collins. But it’s rare to find a gin as at home in a Gin and Juice as it is in a Last Word. Sipsmith Gin is a near-perfect classic style gin. Bartenders and classic-gin fans the world around continue to discover this gin— which is pretty much as good as it gets.